Throughout the show, the audience learned plenty about Ray. They heard about her adventure in South Africa, where she and her husband rode in a small plane with a substitute pilot who was lost. The other passengers became sick, making the ride unpleasant. And once they finally landed at their destination, the tire to the truck that picked them up exploded. Ray claimed she could have died countless times on her trip. The audience learned about her career, and how when Ray has at least 36 free hours, she returns to her home in the Adirondacks. The audience also discovered that Ray plans to take a few years off from writing books, because she is busy preparing recipes for her new television show and for her magazine. 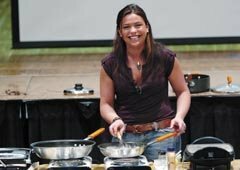 She also completed an episode for Iron Chef, an "excruciating" hour that will air later this year.